The Bowman model number for this engine is 234. The only number on the toy itself is 4472 on the tender but this is obviously not the model number. This was presumably an attempt to cash in on association with the famous LNER engine carrying the same number (Flying Scotsman). This is a bit of a cheat because the number is about the only similarity! At first glance the engine appears to be a 4-4-0 wheel arrangement but, in fact, only the rear axle is powered. What this makes it in the Whyte scheme is open to debate. (My guess is 4+2-2-0.) 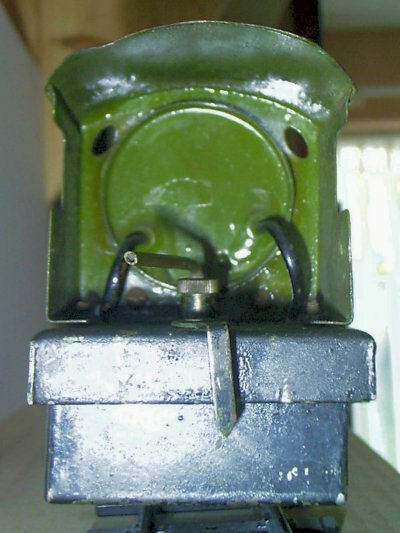 Unusually for a toy locomotive, the front bogie actually supports the weight of the front of engine. The central axle is free to rise and fall with the track and only provides lateral guidance. The flanges on all the wheels are extremely deep and will not run on scale track (or even the Mamod track shown in the photographs). It was originally supplied with track having extra deep rails, typical of toy railways of the time. The two cylinders (3/8"diam x 7/16" stroke) are single acting oscillating type fed directly from the boiler (2" diam x 8 1/2"), with no control, and exhausting into the chimney. The steam feed follows a rather tortuous route from (presumably) the inside of the dome at the top centre of the boiler, out through the rear end of the boiler inside the cab, out to the sides and forwards along the running boards to the cylinders at the front! This might have made sense if they had passed under the boiler thus superheating the steam but they don’t. The only boiler fittings are a safety valve, just in front of the cab, and level plug on the front end of the boiler. Incidentally, the boiler extends right to the front and the chimney passes through it. The "smokebox" is just painted on. The rather large fuel tank is situated under the cab and feeds an impressive array of no less than 6 wicks under the boiler. The 6 wheel tender (250) is purely decorative and serves no practical purpose other than to carry the legend LNER 4472. The engine is painted in (approximately) traditional LNER livery: lined apple green and black.